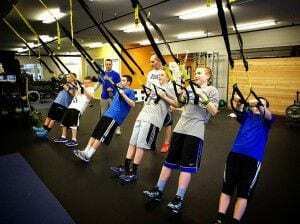 Innovative Fitness is the leader in the South Sound for sports performance training. By learning to train smart, our athletes leave our program fully prepared for their sport. We are able to get maximal work capacity and effort out of our athletes by using positive reinforcement and developing trust and respect over the course of the athlete’s training. Our training environment is one that fosters intensity, drive, and focus which transfers over to each athlete’s sport. Challenging, individualized workouts designed to prepare all athletes to perform at their best. Results-driven and scientifically based program proven to increase athletic performance and maximize potential. Emphasis on injury prevention and improving quality of movement. Proper weight training techniques supervised at all times. The workout consists of functionally sound movement training, strength training and conditioning with a strong focus on basic and proper technique. The workout becomes progressively more challenging once basic techniques have been mastered. Groups are kept small to allow the maximum amount of individual attention in a team environment.